Sometimes the simplest and most common activities trigger something deep inside of us. This could be an aha moment for a solution to situation, answer to a lingering question or perhaps a creative moment that for a small millisecond everything becomes clear. This recently happened for me while taking a hot steamy shower. There was nothing significant about the morning routine. Especially the part about stepping into the shower and continuing to turn the hot water faucet to hotter as my body adapted to the temperature. See, I love hot steamy showers, the kind that where the temperature of the water penetrates the heat deep inside. The temperature that when drying off, notice the redness that the water left behind. Yes, I do know that this temperature is not ideal for skin reasons. But, I like it, it helps me to energize and quite frankly it just feels good. So moisturizer don't let me down now~! See for me, a steamy hot shower is so soothing for many reasons. Got to thinking how hot steamy shower and change are similar. The comfortablity of present delays us from making changes that are necessary for many reasons. 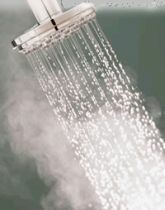 The steamy hot shower is comfortable and soothing....Hot water lasts for a period of time before the cold jolts us, just like change jolts us. The key is to enjoy and exit before the jolt takes hold. So what exactly does this mean? Perhaps all too often the comfort of our every day lives takes precedence over seeing or not wanting to see the changes happening around or what needs to change. The warm cozy feeling of our every day lives, like the hot shower, invokes a sense of safe space. Safe is beautiful however if change is swirling around, taking control and meeting it head on is so much better than a jolt that could potentially spiral out of control. Time for me now to encourage awareness and to always enjoying the warmth and comfort of living.